The Ypsilanti Schools' Board of Education met Monday night to begin the second search for a superintendent, after the board could not choose a candidate in May. Jul. 14, 2009 · 12:10 p.m. 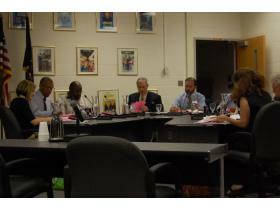 The Ypsilanti Board of Education re-embarked on its search for a new superintendent, Monday night. The Board, looking to replace retiring Superintendent Dr. James Hawkins, could not come to an agreement on a new superintendent in May. Neither finalist, Dr. Theresa Saunders of East St. Louis District 189 or Richard Weigel of Ypsilanti Public Schools, was able to garner enough support to be named superintendent. Approximately 35 applications were sent to the board by the new July 3 deadline. Those 35 included 17 applications from those who were part of the first round search that the board decided to re-examine. The board decided to consider five applicants, two of which are from the newest round of applications. For privacy reasons, the board will not release the names of the applicants until each one has agreed to allow their name to be made public. Despite receiving a fresh batch of applications, not all were particularly impressed by the new applicants’ qualifications. “I was not enthralled or terribly excited about any of the second round of applicants,” Board president David Bates said, adding that his heart “sank lower and lower and lower” as he looked through the applications. Trustee Kira Berman told the board that no one on the new list of applicants made her “do backflips,” but indicated she was willing to consider a few of the most recent applications. As he did after receiving the first round of applications several months ago, Trustee Andrew Fanta chose not to support any of the candidates. “I consider this school district to be a treasure and I do not believe these people to be first caliber,” Fanta said. He added that he preferred to hire an interim superintendent and continue the search later. Although Fanta told the board he did not support any of the applicants, he also indicated that he’d be a “good team player” and take part in the interview process once it began. Once the process begins, there may be some changes compared to how the board interviewed candidates in May. Dr. Michael Emlaw of the Michigan Association of School Boards, whom the board hired to assist with the search, recommended the board consider not actually conducting site visits as these may prove to be of little value during summer vacation. Instead he suggested getting a list of 20 colleagues and community members from the applicants and doing a more intense search through those references. The board plans to conduct interviews during the first week of August and hopes to have a decision on a new superintendent not long after. The board approved the sale of Fletcher Elementary School to Eastern Michigan University for $2.2 million. EMU President Susan Martin attended Monday’s meeting and told the board she was pleased the school will continue to be used for educational purposes. EMU plans to use the school for an autism center and to house its children’s institute. “I think it’s a real win-win for the school district, the university and our community,” Martin said, regarding the sale.